Have you ever wanted to read the minds of your website visitors, see what they're looking for, and show them a page specially written to maximize chances of getting a sale? Now you can. WSN Redirector's concept of redirect marketing is simple, yet powerful. When a visitor comes to your site, the browser HTTP_REFERRER value tells what page the visitor came from. This referring URL may be an article URL that contains the article title, some other page with a descriptive name, or a search engine link containing the keywords the person was searching for. Important Note: Now that google uses HTTPS by default for almost everyone, the vast majority of search traffic doesn't transmit an HTTP_REFERRER value anymore. 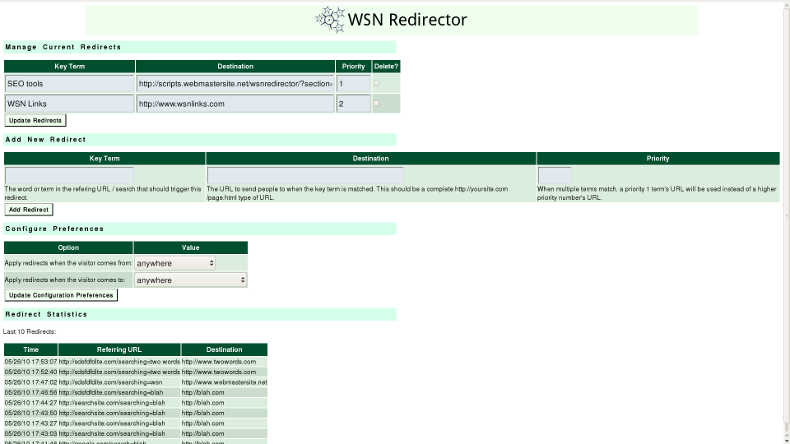 WSN Redirector can still be used for non-search-engine traffic and the remaining slice of search engine traffic. Now, you can step in and take control. When the referring URL contains key terms, WSN Redirect Manager lets you redirect the visitor to an appropriate new page. When someone comes from a URL containing "free" you can show them a page of your free stuff. When someone comes from a URL containing "widgets" you can show them your widgets page. Download WSN Redirector now and install it yourself for free. Download wsnredirector.zip and extract it on your hard drive. Note: If you get an empty or 1 KB file on download, you may need to deactivate programs such as Norton which can block you from downloading files. Upload the wsnredirector directory you've just extracted to be a subdirectory of your web root -- that's in public_html or www, normally. If suPHP isn't enabled on your server you'll need to CHMOD config.php, data.php and statsdb.sqlite to 666. Visit http://example.com/wsnredirector/ in your web browser (replacing example.com with your site) to set up your redirects. Check your stats tracker, like google analytics, to come up with redirect ideas. into the <head> section of your website pages. If you have PHP pages and the know-how to edit them, you can use <?php $origdir = getcwd(); chdir($_SERVER["DOCUMENT_ROOT"]. '/wsnredirector/'); include 'phphandler.php'; chdir($origdir); ?> instead to eliminate the slight delay in redirecting. Perpetual access to the script, plus updates. Support to answer to any questions you have about using the script. Integration with desired areas of your website done for you. Script updates loaded for you on request.